The air conditioners in Phoenix work harder than most, especially during the summertime. Our temperatures are some of the hottest in the United States. Staying cool isn’t just a luxury; it’s an essential. At Integrity, we get a unique look into the work that Phoenix air conditioners do every day. Helping these hard working HVAC units stay up and running is our passion, and we’re often really impressed by their toughness. However, the older the units get, the more energy and time they need to do the same amount of work. An outdated unit can be a big money sink, and it can actually cost you less in the long run to invest in a new unit. 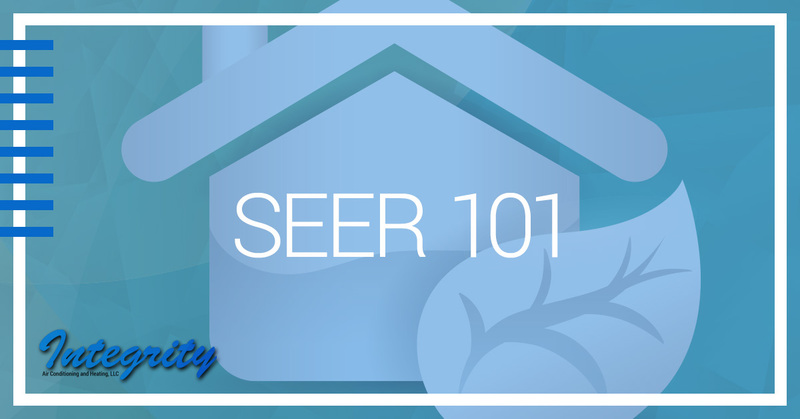 When you explore new A/C units, you’ll probably hear about SEER ratings. These are important to pay attention to because they affect your energy bills. In today’s blog, we will explore SEER ratings and give you some pointers on how to navigate them to get the best results. “SEER” is an acronym for Seasonal Energy Efficiency Rating. It’s a system for ranking air conditioners by how efficiently they cool homes and business compared to other air conditioners. Another way to think of it is the miles per gallon of an air conditioner. The higher miles per gallon a car gets, the better its efficiency. The same goes for air conditioners. The higher the SEER, the more efficient the air conditioner is, and the more money it can save you. When you go shopping for a new air conditioner, you’ll see that SEER ranges from 13 to 28. What is the Best SEER for My Home? While the highest SEER will give you the best efficiency, highly-rated air conditioners are expensive. It’s important to get the highest-rated air conditioner for your budget. If you’re currently using an old conditioner, you can be sure that you’ll enjoy improvement even if you don’t get the ultimate highest rating available. When you settle in to figure out which rating will work for you and your budget, here are some things to consider. Your budget. You need an air conditioner that will you improve your energy bills while not breaking the bank to purchase and install. Energy savings. Look into how much the new unit will save you on energy. You can use NATE’s Annual Energy Savings Calculator or the Energy usage and Payback Calculator by Energy Star. You want to be able to make back the money you spend on the unit in savings. How long will you live in your home? The average air conditioner lasts between six and 17 years. Its lifespan depends on how well it was installed and how often maintenance gets installed. This means that if you invest in an expensive air conditioner, you need to live in your home for a significant amount of time to make your investment back in energy savings. Efficiency issues with your home. Many times, homes have inadequate insulation, leaky ducts, and doors and windows that don’t seal. All of these factors will negatively affect your energy bill. Sizing issues. The bigger the air conditioner, the better it can cool. If you get a unit that is too small, it won’t be able to do its job without constantly running and increasing your energy bill. If your unit is too big, it will have to turn on and off often, which also drives up your energy bill. Our expert team will be able to ensure you get the correct unit for your home. Installation. We’ve found that a large part of the energy people spend on cooling their homes gets wasted because their A/C units are installed incorrectly. That is why we work so hard to be the contractors who always go the extra mile for our clients, ensuring that every unit we install is set up to truly save them money on energy bills. We at Integrity are proud to be Phoenix’s premier air conditioning and repair company. Schedule a consultation with our courteous, dedicated team for service you can trust today!